He clearly wants to show how utterly silly it is to own gold. It’s humiliating to the people who own [Coca-Cola] common. This is why valuation is so important. This is why price and the margin of safety is so important. In 1996 Coke was whatever 39 times earnings or something and gold was known to be the refuge of not the fearful but of the idiots. And to be sure I don’t fault Mr. Buffett as an investor it would hardly behoove me to do so, but I do observe that over these past not so prosperous dozen or so or more years, the commodities have done better than even the best quality equities. However, since we here at Golden Markets happen to believe in measuring things in gold instead of inflated fiat currencies, especially in the longer run, we have produced our own tables and graphs on how Mr. Buffett has performed in relation to holding real cash, i.e. gold. Looking at things this way, we see that although Mr. Buffett might be a super investor in terms of US dollar, in in terms of real cash (gold), the track record looks less impressive. It seems to be mostly dollar inflation behind it all. Secondly, we can have a look at the development for each year during the period at hand, as well as the accumulative returns. We are big fans of Ben Graham and value investing, and to some extent Mr. Buffett as well. He’s good, no doubt about it. But we must also point out that it doesn’t necessarily help much to have more and more of something that is itself vanishing. The US dollar is vanishing, and as such, is a very poor unit-of-account. 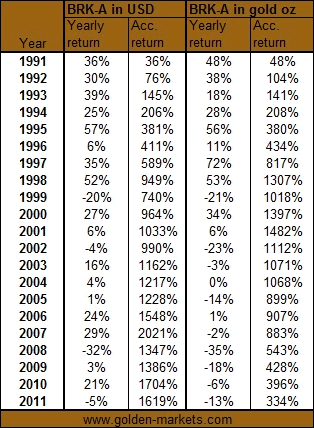 Investing in even such a good share as Berkshire Hathaway, with yearly drawdowns of as much as 35%, with negative returns almost every other year, all for a meager return of 5,9% on average, is it really worth it? Would Mr. Buffett himself do that? “Whatever the currency may be”, Mr. Buffett wrote. Is that really so? Or is it rather “whatever the fiat currency may be”? Maybe real cash is king, or at least not all that bad? What do you think, Mr. Buffet? 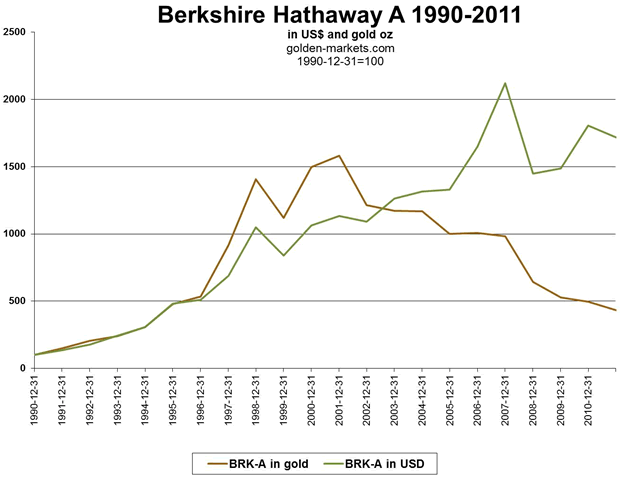 We find it hard to see how Mr. Buffett can make the claims he makes about gold. However, there’s one thing we clearly agree with Mr. Buffet. He noted that “if you own one ounce of gold for an eternity, you will still own one ounce at its end.” Indeed, we also think so. This is one major reason why we think gold is the premium cash, or real cash.